Chhatbir Zoo is located in Zirakpur region of Punjab. It is also known as Mahendra Chaudhary Zoological Park and Chandigarh Zoo. It is large category zoo, as per CZA guidelines. Chandigarh zoo is spread over 505 acres, making it very large in area as well. It was established on 13 April, 1977. The first discussion of establishing a zoo here was started in 1973, and it took 4 years for the authorities to build this national park here. 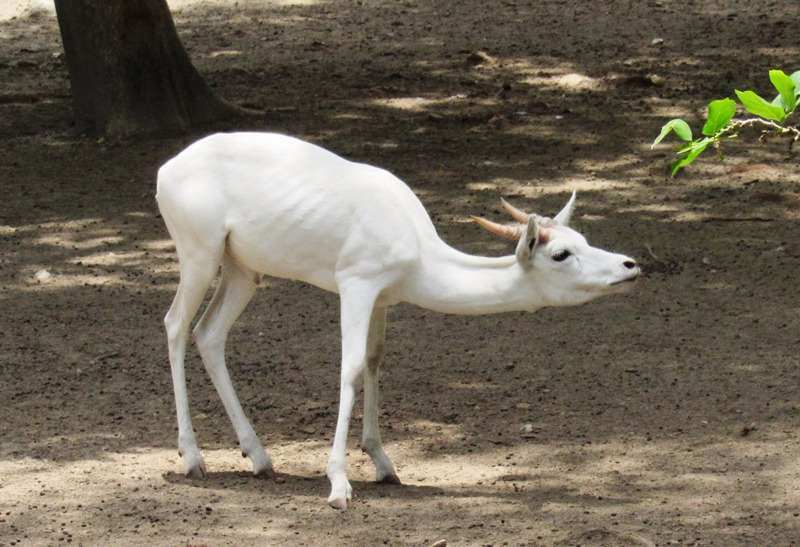 Many species of animals and plants can be found in Chandigarh Zoo. There are as many as 103 species and 1241 animals housed in the zoological park. Zoo has various sections, including Nocturnal house and reptile house. This park also has lion safari and deer safari, which can be covered by zoo provided buses by paying entry fee. It has wheelchairs for differently abled person. In Chhatbir Zoo, animals and birds of various variety are present. Main attraction of zoo includes lion, bengal tiger, white tiger, leopard, elephant etc. 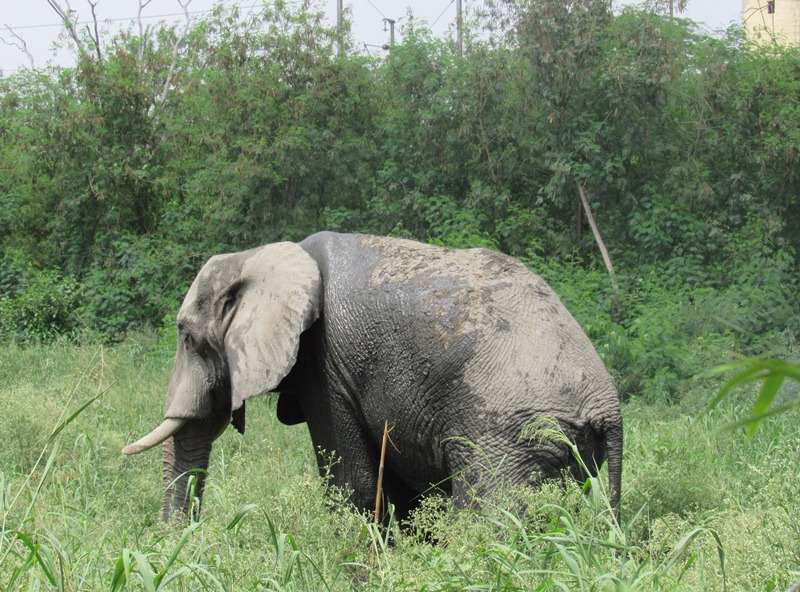 These elephants are kept in well maintained enclosures. 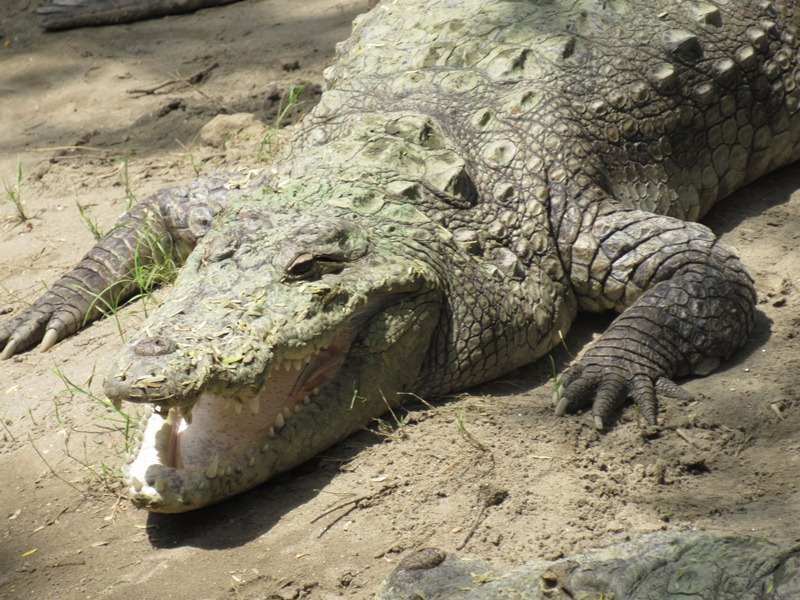 Reptiles are also present here; such as Gharial, crocodile, python, monitor lizards, Cobra and turtles. Mahendra Chaudhary Zoological Park contains thousands of plants and trees belonging to various categories. As many as 1241 animals are hosts here, in this green campus. Chhatbir Zoo timing is similar throughout the year and its holiday is on Monday every week. Zoo weekly off is Monday. Zoo opening time is 9 AM and it closes at 5 PM everyday. Lion safari is also available, timing of lion safari is within the span of 15 minutes. It is not very big safari, so 15 minutes of time is required for them to complete the lion safari. Best time to visit Mahendra Chaudhary zoo is during early hours as the weather is cold here, allowing visitors to enjoy the nature. Similarly, Monsoon and winters are also a good time to visit the zoo. It takes 3-4 hours to cover the entire zoo. Chhatbir Zoo ticket rate are very nominal and the option of offline and online booking is available. The entry ticket for adults is 50 Rs while it is 20 Rs for children(3 -12 years). There is a special discount rate for school students in group. The price is 20 Rs for primary school students and 30 Rs for high school students. Still camera and video camera is allowed inside the zoo, by paying entry fee. For differently abled person or media personnel, entry fee is free. One need to pay 100 Rs for still camera and 150 Rs for video camera. Commercial shooting charge is 25000 per day. Battery operated vehicles are also available inside the zoo premises, for those who don’t want to walk. Battery operated vehicle charge is 50 Rs for adults and 25 Rs for children between 3-12 years of age. For children below three years, zoo entry and battery vehicle charges are free. Chattbir Zoo lion safari tickets are 50 Rs per head, and it is free for children below 3 years. Is someone is differently abled, they can get a wheelchair inside the zoo, for free. Chhatbir Zoo map is very detailed and it takes you through the virtual tour of the zoo. By studying the map, one can easily save their time and ensure that they do not miss anything important. 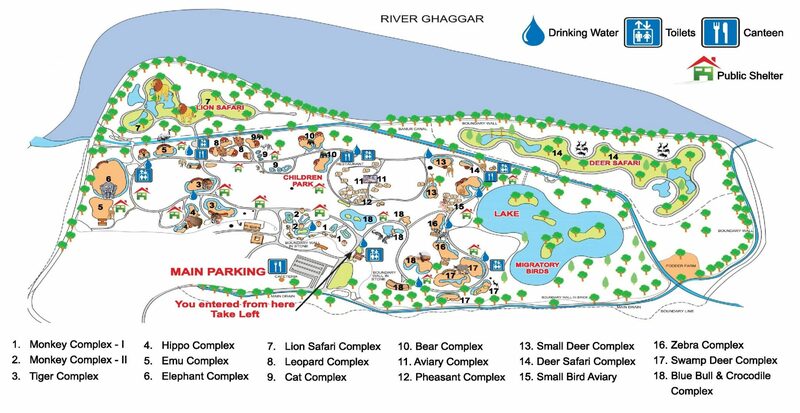 Layout shows various enclosures, children park, Lake, location of migratory birds, deer safari and lion safari. The map shows nearby roads and entry gates of zoo campus. Basic facilities such as water cooler, washrooms and cafeteria are also shown by legends within the zoo premises. It is very detailed and makes sure that everything is covered by visitors. Chhatbir Zoo is very close to main locations and easily reachable by road. Chattbir Zoo Chandigarh is located at a distance of 16 KM from Chandigarh Railway station and takes around 30 minutes to reach here by car. Chandigarh International Airport is at a distance of 12 Km, which is not much. Zirakpur bus stand is 7 Km from the Chattbir zoo and Dera Bassi bus stand is located at a distance of 14 Km. Chhatbir Zoo bus stand is the nearest bus stand, and it is in front of zoo entry gate. Location of Chandigarh zoo is within 20 Km from various main points of city and taxi or cabs can also be used to reach here. Chhatbir Zoo is a very good zoological park, located in the northern region of India. The zoo premises is well maintained and it has many animals. Management of the zoo has provided various facilities to their visitors. The battery operated vehicles are provided within the premises, which work on hop on and hop off basis. At the ticket counter, if someone had paid entry ticket, they gets a hand tag. By this hand tag they can get down from vehicle at any location and can board at any location, among the pre decided stops. It allows them to spend as much as time they want, at the place of their choice. The water coolers are fitted with RO and they are present at frequent intervals, similar way washrooms are also located. Personal vehicles are not allowed inside, with the exception of bicycles. Visitors can bring their bicycles and enjoy the ride by paying 10 Rs as its entry fee. Food court and visitor shelters are present too, making the convenience of visitors in mind. Chhatbir Zoo images are very lovely and bringing own camera inside can be a good decision. Chhatbir Zoo has parking for private vehicles and it gets too crowded on busy days. Also visit Mohali Cricket Stadium during cricket stadium.